Sweet corn is the second picking of the first crop. The ears are always smaller and less full. One and done delivery for the sugar snap peas – you can eat the entire pod or shell them if you prefer. Great in stir-fry. 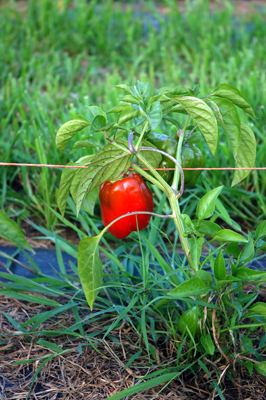 Tomatoes – yellow minis or red slicers can sit in a closed paper bag to ripen on your counter if needed. Cauliflower is great roasted with oil/salt/pepper until golden brown. Lots of smaller, tasty eggplant for everyone this week. We will slice three at a time and roast with oil until browned and eat them as a snack. Terribly dry around the farm. We are always hoping the 40% chances of rain will yield something. 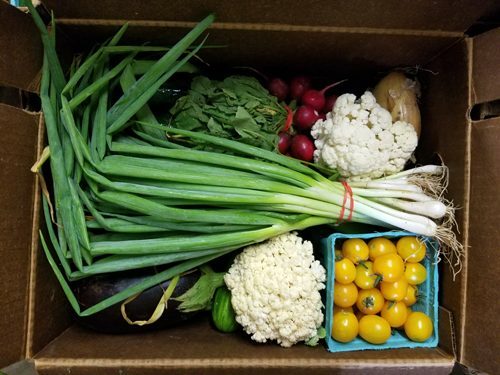 We are now half way through the summer CSA season. It was early May when I first met Norm at a café in Saint Paul. After giving me the details about the summer internship, he asked if I had any questions. The main thing I wanted to know was if there were wild spots near the farm and if I could harvest some plants on the property — stuff like clover, burdock, plantain. Having spent the last year studying herbalism at Minneapolis Community & Technical College, my goal for the season was to get to know and experiment with these plants. “You want to harvest the weeds? We have plenty, knock yourself out.” were his exact words. What farmer would say otherwise? He probably thought I was a bit of a weirdo, but I guess I made a good impression. How pleased I was to arrive at Earth Dance and see medicinal plants all around. 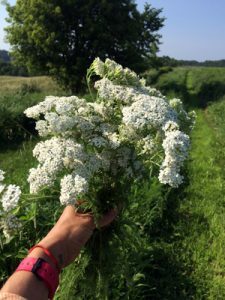 They grow in between the cultivated fields, in the woods at the back of the farm, and in the small herb garden (where I was surprised to find wonderful but underrated herbs such as lovage). Many plant varieties thrive in the untamed patches here, attracting copious pollinators: it’s a healthy ecosystem. For someone passionate about foraging, cooking, and herbalism, an organic farm is a playground. Despite the fact our work week is demanding, I keep my hands busy even when I have time off. While we planted lettuce I picked up pieces of dandelion roots — conveniently uprooted by the plow — and on weekends I gathered elderflowers along Bear Creek accompanied by the dogs. And then there are all the nutritious wild edibles: nettles, chickweed, purslane. Fortunately, I work with a great team of good eaters who are always eager to try new things. As my last day at the farm approaches, bright yellow goldenrod dominates the landscape and I have just enough oil to make one last batch of salve. Like arnica, goldenrod is great for sore muscles, making it a very useful “weed” to have on a farm (says the sore intern). Harvesting and bunching herbs for the boxes has been an enjoyable task, even when it took hours. There is no better way to enliven a dish than adding aromatics, so I hope they have inspired you to broaden your gastronomic repertoire. 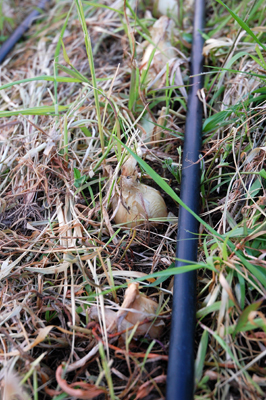 With the exception of chives and coriander, those plants dry well and keep for a couple of years. Most culinary herbs make tasty infusions and have healing properties, so don’t let them go to waste. Food IS medicine! Sugar snap peas, as well as snow peas, are unique because they belong to a different species of peas wherein the whole pods are eaten. They are a common garden vegetable given the fact that they are easy to grow and they also have the ability to grow throughout temperate and colder climates; plus they are delicious! Sugar snaps are thought to have originated in Europe and are often referred to as Mange Tout which means “eat all” in French. They make for a great snack simply eaten raw, but are also great when prepped in/with a meal. Trim, rinse, dry and they are ready to go!